The 401st Bombardment Squadron is an inactive United States Air Force unit. Its last was assigned to the 91st Bombardment Group, stationed at Drew Field, Florida. It was inactivated on November 7, 1945. The 405th Tactical Training Wing was stationed at Luke AFB, Arizona. The 405th TTW was activated in 1979 receiving the RTU (replacement training unit) task from the 58th Tactical Training Wing (also stationed at Luke AFB, the 58th TTW transitioned to the F-16). The 405th TTW consisted of 4 squadrons, the 426, 461,550 and 555th TFTS. Thanks to www.skytrailer.com for the information. Basic shipping included to most countries. Additional costs may incur for EURO, South America and African countries. The 407th Air Expeditionary Group (407 AEG) is a provisional United States Air Force unit assigned to the United States Air Forces Central 321st Air Expeditionary Wing. It is stationed at Ali Air Base , Iraq. The unit was inactivated with the closure of Ali AB on December 16, 2011. Thanks to wikipedia for the information. TheUnited States Air Force's 410th Air Expeditionary Wing (410 AEW) is a provisional United States Air Force unit assigned toAir Combat Command (ACC). It may be activated or inactivated at any time. Emblem of the Twelfth Air Force 415th Night Fighter Squadron Constituted 415th Night Fighter Squadron on February 8, 1943. Activated on February 10, 1943. Inactivated on September 1, 1947. Redesignated as: 416th Fighter-Bomber Squadron on November 15, 1952 Activated on January 1, 1953. Inactivated on 8 February 1958. Thanks to Wikipedia for the information. Basic shipping included to most countries. Additional costs may incur for EURO, South America and African countries. The 418th Flight Test Squadron (418 FLTS) is part of the 412th Test Wing and is based at Edwards Air Force Base, California. It performs flight testing on MC-130HCombat Talon IIand AC-130U Spooky aircraft. Redesignated 418th Bombardment Squadron, Very Heavy, on May 13, 1947. Activated in the Reserve on May 29, 1947. Inactivated on Jun 27,1949. Thanks to Wikipedia for the information. Basic shipping included to most countries. Additional costs may incur for EURO, South America and African countries. The 419th Night Fighter Squadron is an inactive United States Air Force unit. Its last assignment was with Thirteenth Air Force, being inactivated at Floridablanca, Luzon on February 20, 1947. Mar 18, 1954: Activation at Alexandria AFB, La., under command of LTC F. R. Bates. First unit in TAC of its type. Jun 20, 1954: First Flight in KB-29 from Alexandria. Sep. 1, 19 54: Maj J. F. Groom assumed command. Thanks to www.tactankers.com for the information. Basic shipping included to most countries. Additional costs may incur for EURO, South America and African countries. Constituted 420th Night Fighter Squadron on May 25, 1943. Activated on June 1, 1943. Disbanded on March 31, 1944. Thanks to Wikipedia for the information. Basic shipping included to most countries. Additional costs may incur for EURO, South America and African countries. Thanks to www.f-16.net for the information. The 421st Fighter Squadron The spider, the namesake of the squadron, characterizes the aggressive determination and awesome capability of the unit. Thanks to www.vipersinthestorm.com for the information. This is a remake of super rare World War II 422nd Night Fighter Squadron, 9th Air Force. The squadron was attached to the IX Tactical Air Command, 71st Fighter Wing, IX Air Defense Command, IX Tactical Air Command. 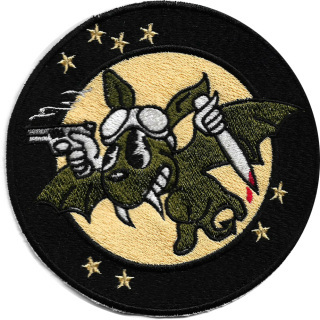 The patch is a bat wearing a flight helmet pushed back up on his head who invites the enemy to pick their poison: revolver or dagger. Thanks to www.flyingtigerantiques.com for the information. 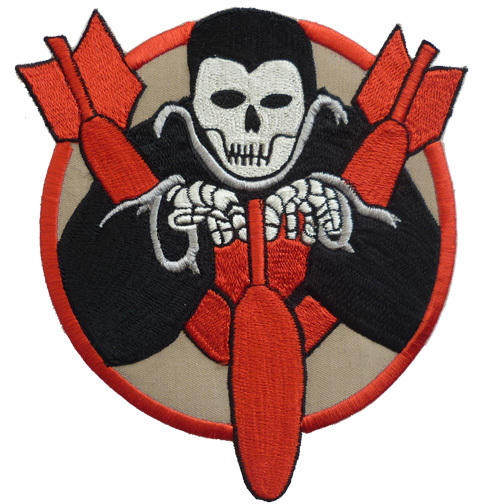 This is remake of an extremely rare Chinese jacket patch for the United States 425th Bomb Squadron, 308th Bomb Group, 14th Air Force. The patch shows a whimsical winged dragon. Thanks to www.flyingtigerantiques.com for the information. Basic shipping included to most countries. Additional costs may incur for EURO, South America and African countries. Redesignated 427th Bombardment Squadron (Medium) on August 20, 1958. Activated on 1 December 1958. Discontinued, and inactivated, on January 1, 1962. Thanks to Wikipedia for the information. Basic shipping included to most countries. Additional costs may incur for EURO, South America and African countries. The 429th Bombardment Squadron is an inactive United States Air Force unit. Its last assignment was with the 2d Bombardment Wing, based at Hunter Air Force Base, Georgia. It was inactivated on January 1, 1962. Activated on July 10, 1952. Redesignated 429th Tactical Fighter Squadron on July 1, 1958. Reactivated May 15, 1967. Inactivated Sep. 30, 1989. Thanks to www.enotes.com for the information. Marine Bombing Squadron 433 (VMB-433) was a United States Marine Corps medium bomber squadron during World War Ii. The squadron flew PBJ medium bombers which were the naval version of the B-25 Mitchell. The 434th Fighter Training Squadron (434 FTS) is part of the 47th Flying Training Wing based at Laughlin Air Force Base, Texas It operates T-38 Talon aircraft conducting flight training. The 436th Tactical Fighter Training Squadron is an inactive United States Air Force unit. Its last was assigned to the 479th Fighter Group, stationed at Holloman AFB, New Mexico. It was inactivated on August 2, 1991. Thanks to airforce.togetherweserved.com for the information. Basic shipping included to most countries. Additional costs may incur for EURO, South America and African countries. The 442nd Squadron's original insignia was a cartoon figure of Donald Duck cradling a bomb and charging forward. This design which, caused the 442nd to be nicknamed the Ugly Duckling Squadron, was used throughout the war. Thanks to 320thbg.org for the information. Basic shipping included to most countries. Additional costs may incur for EURO, South America and African countries. The 443rd throughout the war used a black African native figure crouching in jungle foliage and blowing a bomb out of a blowpipe. The figure held a shield with the U.S. star insignia. Thanks to 320thbg.org for the information. Basic shipping included to most countries. Additional costs may incur for EURO, South America and African countries. Constituted 445th Bombardment Squadron (Medium) on 19 Jun 1942. Activated on 26 Jun 1942. Inactivated on 12 Sept. 1945 Redesignated 445th Bombardment Squadron on May 26, 1947. Basic shipping included to most countries. Additional costs may incur for EURO, South America and African countries. Re-designated 445th Fighter-Interceptor Squadron on Feb11,1953. Activated on March 20, 1953. Inactivated on 30 Sept 1968. Thanks to Wikipedia for the information. Basic shipping included to most countries. Additional costs may incur for EURO, South America and African countries. Constituted as the 446th Bombardment Squadron (Medium) on June 19, 1942. Activated on Jun 26, 1942. Inactivated on September 12, 1945 Thanks to Wikipedia for the information. Basic shipping included to most countries. Additional costs may incur for EURO, South America and African countries. Redesignated 448th Bombardment Squadron (Light) on May 26, 1947. Activated in the reserve on June 29, 1947. Inactivated on June 27, 1949. Thanks to Wikipedia for the information. Basic shipping included to most countries. Additional costs may incur for EURO, South America and African countries. Activated on June 26, 1942. Inactivated on September 12, 1945. Thanks to Wikipedia for the information.Basic shipping included to most countries. Additional costs may incur for EURO, South America and African countries.